All because people are too lazy to find a sink. Makeup remover wipes are a seriously uncool addition to one’s makeup bag. They are notoriously bad for the environment, made of non-biodegradable plastic fibers, and are key players in catastrophic sewer buildups, like the giant ‘fatberg’ in London’s sewer last year that was as big as 11 double-decker buses. They litter beaches around the world, with the Marine Conservation Society estimating an average of 35 wipes found on every kilometre of beach in the UK. 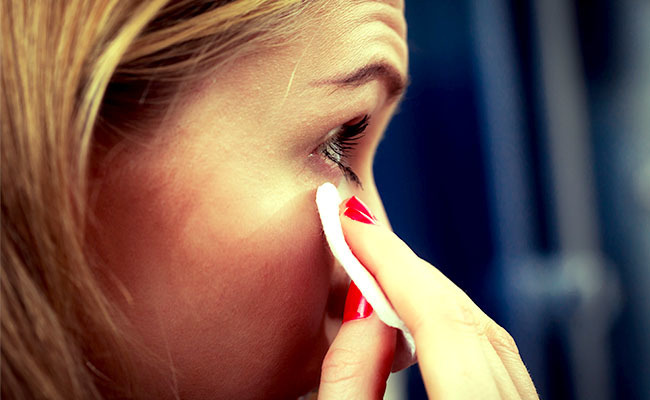 Makeup remover wipes serve no other purpose than to remove makeup quickly and easily, without the addition of water. Now, as a woman who wears eye makeup every day, I totally understand the allure of being able to remove one’s makeup almost instantaneously, but can we please have an honest conversation about how hard it is to find a water source on a daily basis to wash one’s face? It’s not. The gym has a sink. Your “impromptu sleepover with a Bumble date” probably involves a sink too. Even your campground has a sink, or at the very least you have a water bottle you can splash on your face. You had to brush your teeth, after all, and how did you do that? Convenience comes at a price and, knowing what I do about plastic contamination, makeup remover wipes do not belong in our world, especially because there are other great options out there. But you have to be willing to walk to a sink or open a (reusable) bottle of water to use them. It works wonders. I’ve given up on all makeup removers because they’re an additional step I can’t be bothered with. Instead I wash my eyes with a bit of olive oil soap. Makeup instantly gone. The purpose of facial cleanser is to cleanse one’s face, and that includes removing makeup. Forget the makeup remover and just give your face a good wash. Right now I’m loving the citrus scent of Plaine Products’ face wash that comes in a refillable metal container. Make your own from old flannel sheets and wash after a couple uses. Use sweet almond oil, coconut oil, witch hazel, or makeup remover. You could pre-soak and put them a jar for later in the day. Pack a small flannel washcloth in a waterproof bag or glass jar in your purse, and you’ll be able to freshen up your face at any point. I’m not a fan of microfibre pads in general, since they’re plastic, but reusable is still preferable to disposable. Enjo makes a nifty Eye Pad that one of my friends swears by; it removes all eye makeup only using water. The Mitty Mini by Take My Face Off is another decent option. Buy an all-natural compostable sponge for removing makeup with soap and water. It washes out easily and dries quickly. Heck, even these are a better idea than makeup remover wipes. Buy organic cotton because it’s way better on the environment. 8. Sleep with your makeup on. The best solution? Go makeup free. I stopped wearing makeup 2 years ago and I'm all the better for it. Some good alternative ideas here. I use white washcloths so they can be bleached. Thanks for the good ideas. I just use Dove bar soap and water.